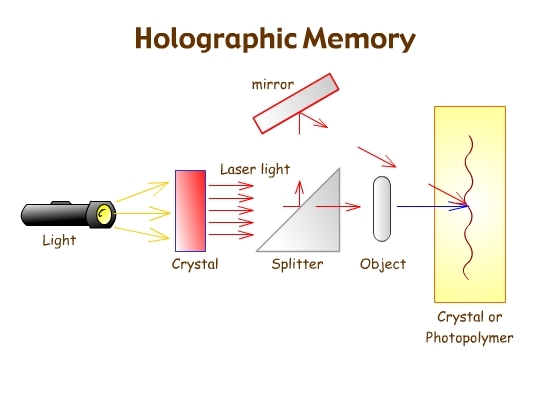 Remember the diagram for a holographic memory device? Let’s do some engineering on this holographic process and see if we can’t come up with a more compact design. The diagram we have here is a crude model, but it gives us a place to start. It lays out the process in easy steps. We want to build a really compact unit. One way to do that, is to eliminate redundancy. Right away we can see that this system uses two crystals, one to create the laser and another to store the image. If we can combine functions in one crystal, we would be way ahead. For that, we need a crystal that creates the laser and also serves as the storage medium. Crystals of different materials have a wide range of properties that could help us here. In computer design, combining crystalline materials is commonplace. There are crystals that produce visible light under certain conditions. Crystals seem to be constructed a lot like a house of mirrors. Maybe we can find a way to eliminate the mirrors and get our light source inside the crystal. We need a crystal made from a composite that has all of these properties. We started with a static diagram and we need something that can store dynamic data. All we have to do to make use of the storage capacity of the hologram is change the angle of the laser to media. So, our crystal needs to be flexible, maybe even liquid. Well then, crystals could potentially solve all our problems. All we need to do is build a crystal that emits laser light, can direct it, while serving as a flexible storage medium. Sounds like a tough assignment, doesn’t it? Do you know what crystalline structure, that has been in the news a lot lately, fits all those requirements? It is DNA. A pure crystal is made up of one molecule that, combined with itself, forms a core unit that defines the crystalline structure and shape. The centers of adjoining core units are equidistant. A quasicrystal is composed of more than one core unit and can have different distances between adjacent centers. So a quasicrystal repeats the pattern of multiple molecules, while a pure crystal contains only one. This high degree of organization produces a resonance that serves to amplify the basic molecular signal. For instance, quartz molecules by themselves can’t do much, but as a crystal they can be used to power a simple radio. Just like a pure crystal, DNA produces a signal. That signal is generated by the combined signals emitted by all the atoms in the quasicrystal. It is just as unique as individual DNA. That signal is called a biophoton. This emission is very weak, but the frequency of that signal is in the spectrum of visible light. So, every cell in your body is emitting light in the range of human sight. This light is not ordinary light, it is in sync, like light from a laser. Every cell in your body has a DNA crystal clock that is in sync with every other cell in your body. Remember, you started out as a single cell in your mother’s womb. That cell divided, split in two, each getting a copy of your original DNA. Each copy of that DNA maintains the signal’s integrity. In the end you have trillions of cells, all in sync, all singing your unique tune in perfect harmony. This forms what is called in quantum physics, a coherent electromagnetic field, aka, a hologram that permeates your physical body. Sounds like the aura to me. This electromagnetic field is in addition to the one that the matter making up your body already generates. The properties of a coherent electromagnetic field are really quite amazing and the fact that biological systems incorporate them in their design is even more astounding. They go a long ways toward explaining how biology accomplishes sight, navigation and thought. Ok, we have our compact biological holographic memory device, but how do we get the data from the object we want to save into this crystal? If we are saving binary data or images, the reflection from the lasers form interference patterns that we save on, or within, media. We create the interference patterns that define the object with our laser light and mirrors. Another way to look at it is that the laser light and mirrors are translating the physical object into a holographic language that can be stored as interference patterns. It is working like a ray tracer in 3D rendering; it is plotting the object’s coordinates. The recorded interference patterns represent the coordinates of the object, along with its texture and reflectivity. In our DNA memory device we don’t need to translate because the information we want to save is already in the form of interference patterns. What the DNA is recording is the current state of the coherent electromagnetic field that it helps generate. That information is already encoded in holographic language. The input for this memory device comes from its membership in the coherent electromagnetic field it helps generate. A permanent feedback coupling between the cells and the whole organism. The coherent electromagnetic field is a realtime, virtual, purely informational representation of the current state of the matter it represents. As each repeated cycle of activity lays down its present status in holographic interference patterns, they are constantly being compared against past patterns. Realtime feedback. That means that the whole organism “KNOWS” what every cell is doing and every cell “KNOWS” what every other cell “KNOWS” at the same time. So this hologram being produced by all the cells is instantly sensitive to disturbance anywhere within the organism. That’s the way a holographic system works. This perfectly describes the self-regulating electrochemical process revealed by the Gaia hypothesis. Besides the coded static information stored in its sequences, our DNA, holographically stores/manages dynamic information within it’s crystalline structure. What is really the key here is that holographic memory records interference patterns by “altering the internal structure of the medium”. Think about that for a minute. Actions carried out in a coherent electromagnetic field produce interference patterns that in turn alter the molecular structure of the recording medium. In this case, our DNA produces the coherent electromagnetic field, that produces the interference patterns and is the medium that gets its molecular structure altered. As the action is repeated, more interference patterns are recorded on top of each other, presumably in some sort of harmonic resonance. This is what is happening in living DNA; it is building a memory that is dynamically changing its own molecular structure. How does this relate to mutation? Is this the system that manages future generations? Is evolution guided by past action thru this process? It sounds very much like Rupert Sheldrake’s Morphic Fields, doesn’t it? So the DNA has the properties of a string of code, but also emits a signal that is part of a holographic memory system. This is memory if you are talking about the past, but in the present, this dynamic memory becomes consciousness; awareness of past, present and future. Since we have only recently discovered these holographic principles we haven’t had time to uncover all of the places that they are operational. However, they can’t be more fundamental than at the quantum level of matter, DNA in biological systems and our own thought process. It should be obvious that these principles permeate all levels of physical reality. Holographic principles make possible the high level of communication necessary to maintain the consistent supply of nutrients required by every ecosystem. Holographic principles provide the information channels necessary for biological systems to keep track of everything at once, and keep all elements notified. Within the Holoverse we have coherent electromagnetic fields that are made up of adjacent agents where the coherent electromagnetic field coincides with the physical structure. There are also coherent electromagnetic fields that are dispersed throughout the environment. They are still connected as one on the informational level while being separate on the physical level. For example, single celled organisms that live in water, but have reproduced by division, all have their DNA in synch just as do all they cells in your body. These cells are all in instant holographic communication with each other as if they were all in the same bag. Life is driven by cycles, just like computers. Very fast short cycles, linked in harmonic patterns of larger cycles. Computer cycles are a creation of the computer hardware engineers and somewhat arbitrary, while Life cycles are in sync with Natural cycles, the Holoverse. Time/space only exists for matter, but the Holoverse contains all segments of the cycles driving Life. The Holoverse contains the past as memory and the future as a holographic projection. The past, present and future of any location are accessible through the Holoverse. As far as we know, an awareness is the only way to access this Holoverse. Yeah, we do carry our history around with us. In this holographic model, the same information is “known” by the Whole. Could be that we are also judged as we go along. Good questions. I’ve been reading alot these days about networks in complex systems. I think that these patterns are alot like crystals. The rules that govern formation of networks are similar to crystals, databases, chips, social groups and cellular processes.